One lament accompanied 2008’s lacklustre Sonic Unleashed more loudly than others – "why can’t Sega ditch the werehog and make the daytime stages into a complete game?" A few years later and in rushes Sonic Colours with all the usual fanfare and expectation around a new 3D Sonic game, except this time – hold on to your spiky hats – it’s true. Things get off to a flying start. There’s no wading through mountains of text to get going, no unskippable cutscenes: just you, Sonic and three Acts of high-speed action to acclimatise you to the controls, which survive mostly intact from Unleashed. After the opening trio of stages you’re greeted by one of the good-quality FMV sequences you'll see throughout the game, though again these are completely skippable if you just want to get back into the action. As you play you start to get the impression that Sonic Team really was paying attention to feedback from players about its ill-fated prequel. 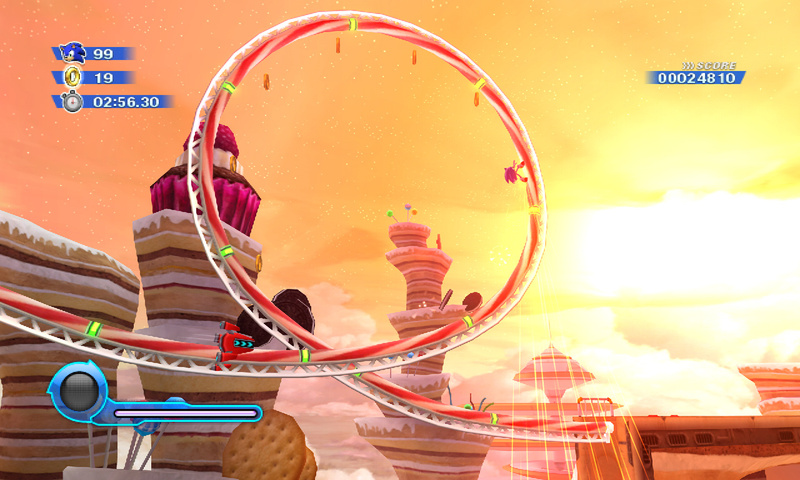 There are no hub city levels to explore, just a top-down map to link stages, which can vary from five minute long roller coasters to shorter tests of precise platforming skill. Smaller tweaks are present too: approach one of the game’s still-common “pits of death” and a small warning icon pops up, advising you to take it slow rather than plough on regardless. Whilst Sonic Team’s “Hedgehog Engine” made the transition between 2D and 3D gameplay swift and seamless in Sonic Unleashed on Xbox 360 and PS3, Sonic Colours pulls off the switches just as impressively. The 3D sections are often stunningly fast and provide all the adrenaline rush you’d expect from a Sonic title, and whilst the 2D portions certainly don’t slack off in terms of speed they still offer a chance for more precise platforming elements. The balance is a welcome one, and although Sonic purists might object to taking their time in the side-on sections, the combination gameplay offers something for everyone and does it all pretty well. The major gimmick with Sonic Colours is the introduction of Wisp power-ups, which all serve to offer Sonic a brand new ability, ranging from high-speed boosting to drilling, zipping about like a laser and just hovering around. In the 2D sections you’ll find plenty of new routes opened up by trying a new Wisp power, and the way in which these abilities are unlocked gives you plenty of reason to go back to explore other levels. The yellow drill wisp is a highlight, letting you tunnel through soft earth to find hidden stashes of rings and alternative routes through the levels, crucial for attaining an S-Rank and the bounty of extra lives that accompanies it. The blue cube ability switches blue rings for blocks and vice versa, something that helps to slow down your exploration, although perhaps a little too much for our liking. Each new power-up genuinely alters the way you play the game, offering up a more layered form of gameplay than we’ve come to expect from a Sonic title. 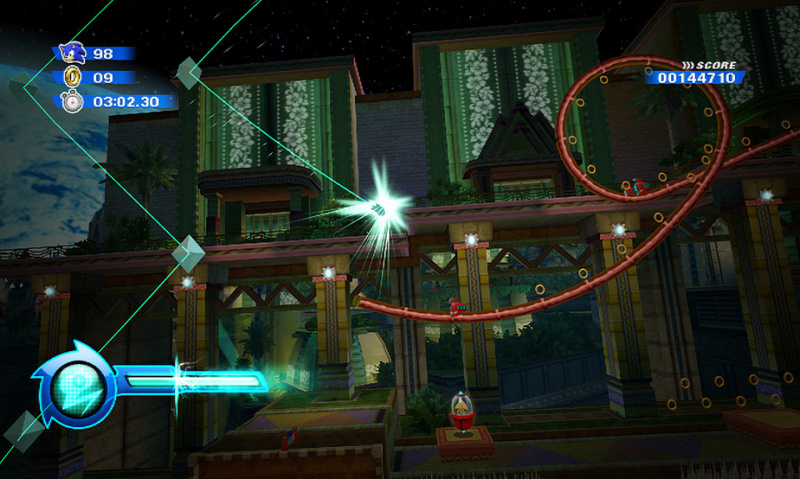 Every stage contains multiple routes and bonus items that can only be found with the correct skill equipped, giving Sonic a reason to return other than just to do the same stage but more quickly. Another unexpected highlight comes in the form of the two-player co-operative mode, something that hasn’t really been seen in a Sonic game since Sonic the Hedgehog 3. Although you can play these stages on your own or with a CPU accomplice, joining forces with a friend next to you provides plenty of classic multiplayer gameplay as you jostle, shout orders and race about to clear the stage as quickly as possible. New co-op levels open up once you collect a certain number of special red rings in the main game, and while there are stages available from the start, it provides another compelling reason to progress. It has to be noted too that Sonic Colours is graphically exceptional, with some great animation, imaginative design and plenty of huge spectacle through its stages. Flying through the fireworks over an advancing spaceship armada in Starlight Carnival, racing along a growing path of light and taking on enormous bosses proves the Wii’s graphical power if it ever were in doubt. Sadly, the musical side of things isn’t as good, particularly compared to the sublime tracks that accompanied parts of Sonic Unleashed, with some fairly generic platformer music throughout the game. It’s nothing original, but at least the voice acting is generally of a good quality and thankfully sparse when in a level, only breaking up certain stages with FMV cutscenes. 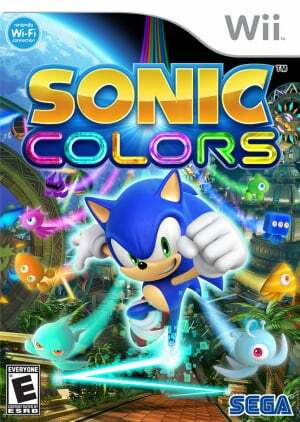 To call Sonic Colours the best 3D Sonic game ever is damning with faint praise, although its title is deserved. The action is fast enough to satisfy your speed lust, whilst the Wisp powers introduce plenty of new skills and ways to explore the stages that otherwise could just be straight zips to the finish. There are no other characters to control, no talking swords and no guns, just plenty of enjoyment. This is the game Sega should have made years ago. Wooot! Sounds awesome, and I've been watching some walkthroughs of the game on youtube: It is BEAUTIFUL. YAH, 9/10! I believe it! It looks amazing. Hopefully I'll get it for Christmas or something 'cause I don't have the money for it right now. Woot! Sonic is making a comeback! Good review James. I'll probably be renting this one instead of buying it, unless I can find it in an amazing Black Friday deal. It looks pretty fun but I'm worried about length and replayability. I've been really tempted to get this game since it was released but I have been waiting for NLife's review. I think this might have persuaded me to buy it! The Sonic cycle is officially broken! Best 3D Sonic game ever, huh? Wow, it must be outstanding to beat out Sonic Adventure 2: Battle, whose only real fault is the somewhat dull treasure hunting levels. So you think the coop mode is good? That goes against the general consensus in other reviews. The only good Sonic multiplayer mode since the Genesis games is in Sonic Adventure 2: Battle. I wish Sonic Team would revisit the excellect competitive race mode in that game one of these days. Still not playing this. Sonic has hurt me too many times in the past. Those cheeseburgers look delicious. Great review, James. This game does not use the Hedgehog Engine. 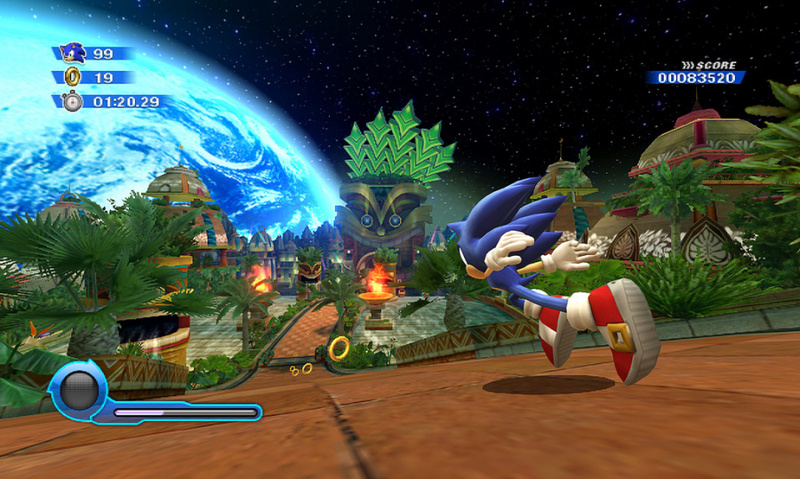 The Hedgehog Engine is a graphics engine made for HD consoles. Unleashed Wii and Colours both do not contain the beautiful Hedgehog Engine and I wouldn't count on seeing it until Nintendo releases a new console. So does this mean I don't have to feel guilty for trading in Sonic Adventure 1 and 2 because I was getting disgusted with the quality of the 3D games? Heroes was the last 3D Sonic I bought and then I damn near gave up on modern Sonic games. I didn't think Sega was ever going to pull off a really great one. Perhaps the cycle is broken. Glad to see a Sonic game with scores this high! I'll get it, but maybe when the price is a bit lower. I've got more than enough games to play in the meantime. @link Yeah, Heroes was pretty bad. I'd already mostly played through the game (87% I think, I know I stopped at the jungle) on a friend's copy. So, When a relative gave me their sealed copy of the game, I traded it in for Sunshine. @XD375 Cheers, I realise it's not specifically the hedgehog engine but the transitions between 3D and 2D are similar. I'll tweak the review for you, cheers. I was waiting your review, looks like sonic has finally found himself. While you saw the co-op mode was good, most reviews saw that it was passable, I don't why. "There are no other characters to control, no talking swords and no guns, just plenty of enjoyment." has changed my thoughts greatly. I may rent this game. RE: Co-op, I can see why it wouldn't be everyone's cup of tea and to be honest I can't see myself going back to it in the same way I will the main game, but I did like it. I think I just enjoy shouting at people when I play games with them, that's all. I should probably get that seen to. Will a game ever game 10/10? @21 Of course they do, such as Super Mario Galaxy 1 & 2, Metroid Prime Trilogy, Kirby's Epic Yarn, World of Goo, Bit.Trip Runner, Super Mario Bros. 3, Super Metroid, Legend of Zelda: Ocarina of Time, etc. They're just really rare. I have to admit I am VERY surprised. Looks like Sonic is making a serious comeback. And that's a guy with my avatar admitting that there was a time when I was concerned lol. I've never given a 10/10 and to be honest I don't think I will. Not until Sega Fusion launches anyway, when I'll obviously give nothing but. Well deserved score, I love this game. Glad to see that my favorite hedgehog is back to his glorius ways. Here's hoping for more to come, Sonic! Damn, now I have to keep playing it. Thanks a bunch, Raylax. Sonic Colors is awesome, cant wait to get it. A Sonic game with a Good Score?! I don't know where I'll get all the money for these awesome games! Great review James! I enjoyed the game so far, but one big problem for me is that some of the wisps aren't very fun to use like the blue and pink wisps. They said that this game would break the Sonic Cycle, and they have succeded! Nice one James. As an original fan of the Hog I agree this may be his best 3D game. I was a bit unsure about the controls until I used the GC controller though, which plays best to me. I really like the music, Planet Wisp and Aquarium Park especially. The slightly more retro sounding versions in the DS game are also great. The IGN review I read said Sonic Riders was great for kids, but James doesn't seem to agree. Granted, I find kids can have more patience that adults, so they may put up withe Free Rider's supposedly frustrating design quirks, provided they don't know any better. This may be a good game but after some of the games I played sega is not getting my money until next year when the price is low. Because paying full price for bad games just does not work anymore. @Crunc I was very disappointed. 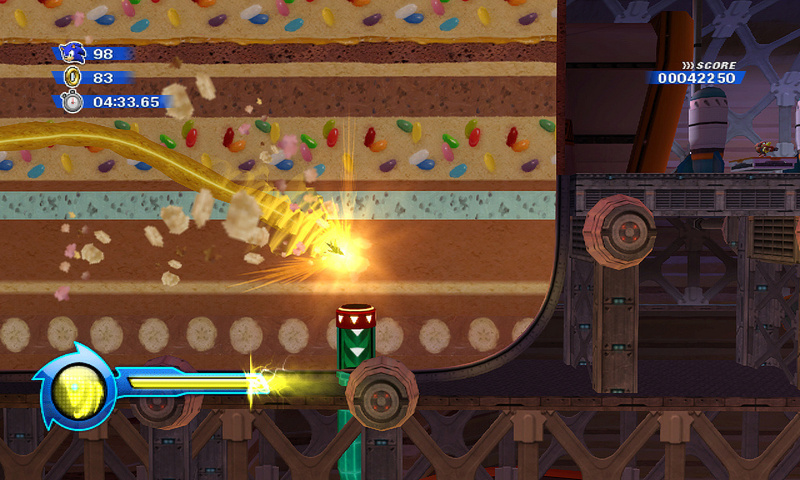 Have a read of my Sonic Free Riders review for more info. The first thing I did was guess that it was going to get a ridculously high rating while scrolling down to see the score. Once my suspicions were confirmed, I guessed that the Supreme Godess had struck once again. So...do I accecpt what the fanboy says...or do I go on my mery way still believing the SNES is the best console invented? XD lol gotta love it. I love the tagline...... It comes from a hymn I used to hum in grade school! Other than that, great review James. Wow good because I'm renting it today. Welcome back! This is Sonic's 3D renesaunce. What Super Mario 64 did for Mario, Sonic Colors is going to do for Sonic. Welcome back, old friend. I've missed you. You didn't like the music?! This has to be the best 3D Sonic game I played since Adventure 2: Battle. It deserves that score, all right. I love this game something fierce. Great review James, very nice. I still like Adventure 2 just a teensy bit more, but that's mostly because I've memorized the majority of it. (Sonic and Shadow's stages anyway) I liked a lot of the music, actually, particularly the Planet Wisp and Aquarium Park themes, but sometimes it is a little bland, mostly the Sweet Mountain theme. I just didn't get a "giant world of sweets" vibe from it. In closing, keep it going, Sonic Team, you're getting you're groove back! Hooray! Awesome review! Can't wait to get this for the holidays! Yeah ! I put Sonic Colors on my wishlist. @morphballer Compared to Sonic Unleashed's soundtrack, this one is pants. I just ordered my copy from Zavvi for a very reasonable £17.95. ... And the Metascore ain't that bad either! 78 isn't that bad considering all the negative-nelly's out there. The user score is probably more fair! Its an absolute cracker of a game. Take it from me. I've been playing it compulsively since its earlier release in the EU. I think it just about scrapes a 9 though as it has its few minor flaws. But by frack is it wonderful. Two great Sonic Games back to back, did we rewind in time to the days of the Genesis? Why didn't somebody tell me? I would have grabbed my copy of Ristar and Dynamite Headdy for the trip as well. If you include the ds version, its actually three great sonic games in about 2 months! Looks damn good. I'll deffinetly give it a rent soon. And will probably end up buying it latter on when its a bit cheaper. Best Sonic game since 3 & Knuckles. I cannot state my love of this game more than saying that. Also, what's wrong with the music? This is the best soundtrack in the series since the Genesis games. WAY better than any of the others. The music has grown on me a bit these past few days, particularly Wisp World which is a good little track. Wow that was the game good note, I hope that the consumer receives the best time and you see the effort. It's an alright review, but I have to object to the "Sonic purists might object to taking their time in the side-on sections" remark. The older games had plenty of slower, actual platforming segments. It smacks of "no one in the sonic fandom can agree on anything" attitude that I'm tired of. Not to say you use it, and I hope you don't actually believe that, but it seems like everywhere I turn I hear something like that. THIS... is the 3D Sonic game Sega should've made in the first place! There's none of that extra character nonsense or any unnecessary gimmicks that drag the action down. It's just trademark Sonic gameplay, where it's all about speed and platforming! Beautiful graphics, a great soundtrack and rock-solid action. I believe Sega and Sonic Team finally succeeded in creating a remarkable 3D Sonic title with Colo(u)rs... Reach for the stars indeed! Always a little hesitant before playing a new sonic game, but this one may be worth checking out. Bright Lights, colors all around. I'll be sure to play this once it's cheap on eBay. "Compared to Sonic Unleashed's soundtrack, this one is pants." Compared to Sonic CD, all soundtracks are pants (yes, I mean the UK one...). Renting this for 2 nights, $4, totally worth it. Sorry, but I only think it's worth about 7.9 stars. Not a Sawneek fanatic. Sry..
God the physics are annoying as hell, how did this ever get a 9? Yeah there's some brilliant bits but a 9 suggests it's mostly greatness. It's not. 6 or 7 would've sufficed, even on the NintendoLife scale. I'm glad I bought it priced down but really, I shouldn't have paid more than $10 for this. I highly recommend checking out the gametrailers review. Easy - but fun! I love it! Poor music?! No, just no. What the hell are you even talking about? !